Two foxes sunbathing in my garden in Gledhow Valley on 15 February 2019. Photo by Mick Burton, continuous line artist, Leeds, Yorkshire. This burst of warm spring weather is bringing out the foxes just about every day. These two spent about 30 minutes wandering around, sitting and just relaxing. 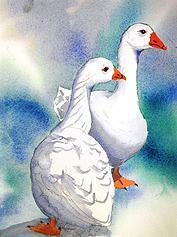 Not too different to the painting which I did of a couple doing similar things a couple of years ago. My single continuous line painting of two foxes sunbathing a couple of years ago. Mick Burton, continuous line artist, Leeds, Yorkshire. The first time I saw foxes in Gledhow Valley was in the late 1970’s, when I lived near the middle of the valley and brought the dog to this end of the woods, above the Well House, and spotted a pair of cubs playing. To see more animals go to the Friends of Gledhow Valley Woods website http://www.fgvw.co.uk . This entry was posted in Animals, Gledhow Valley Woods, My Styles of Drawing and Colouring, Photographs and tagged Continuous Line, Continuous line drawing, continuous line foxes, dog, Fox, fox cubs, Foxes, Friends of Gledhow Valley Woods, Gledhow foxes sunbathing, Gledhow Valley, Gledhow Valley Woods, Mick Burton, Mick Burton continuous line, Mick Burton continuous line blog, mick burton leeds artist, Mick Burton Yorkshire artist, Single continuous line drawing, Well House Gledhow Valley on February 25, 2019 by mickburton2. Kaleidoscopic Wild Horses, continuous line drawing with colour sequence. Kaleidoscopic Wild Horses. Single Continuous Line Drawing with colour sequence in acrylic on canvas. 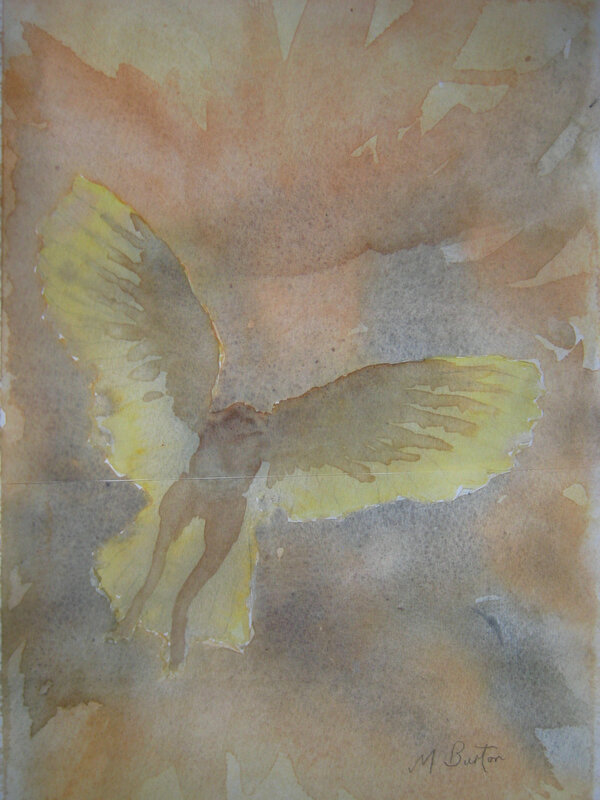 I happened to have a canvas 36″ x 10″ previously intended for an upright picture idea. Mick Burton continuous line artist 2017. This painting originated from a continuous line drawing which I produced for a demonstration at Stainbeck Arts Club, Chapel Allerton in Leeds in May 2017. Wild Horses, single continuous line drawing. Demonstration at Stainbeck Arts Club. Mick Burton, continuous line artist 2017. When I was thinking about a subject for the demonstration I saw an advert on the TV for the Cheltenham Festival which just showed loads of horses running – why there were no riders or jumps I do not know. This also reminded me of one of my favourite paintings – “Scotland Forever” by Lady Butler in Leeds Art Gallery, painted in 1881. A bit like “Charge of the Light Brigade” but straight at you, with the horses wild eyed and seeming to leap out of the painting. Lady Butler painted a lot of war scenes and of course she had no military experience. She was, however, married to a General and she persuaded him to let her watch manoeuvres. In preparation for this picture she asked that the cavalry ride straight towards her so that she could get the feel for facing a charge. When I had finished the demonstration, which was a result considerably rougher than the above, the members asked about colours. I had not intended to talk much about colours, as I thought that my approach to drawing the lines would be enough at this session, but we had a solid half hour talking about my method and ideas about colour. They said that they looked forward to seeing the image in full colour, so here it is. My original intention was to do a black and white alternate shading version only, and this is shown below. The tweaking which I did on the horses heads to achieve a better result in black and white was essential both to improve the continuous line and later to enhance the colouring. Initially I did my normal approach to colour sequence, where I devised a 6 colour range (white, lemon, golden yellow, orange, vermilion red and crimson alizarin) to fit my alternate overdraw template for this image. This resulted in gold and vermilion appearing on all outer areas and I thought that I needed a darker effect in the lower half of the image. So I substituted cobalt blue for gold along the bottom legs of the horses and finished up also substituting, on an ad hoc basis, some dark blue, violet and green to try and naturally leach colour balance upwards to meet existing vermilion and gold. A fellow artist who likes my alternate overdraw and colour sequence method has told me that I should always apply it fully to get the natural result. Generally I would agree, but thought that I needed to break some rules on this occasion. 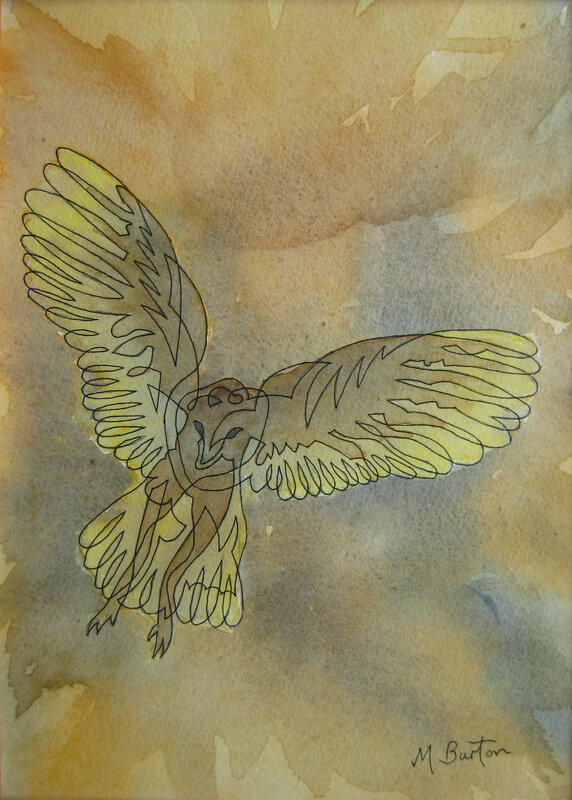 I try and mirror nature in my art and of course nature evolves by breaking a few rules. Joan and I visited my Aunty Ann a couple of weeks ago. She is 99 years old and still as bright as a bobbin. She is a good artist and only gave up painting relatively recently, and always wants to see my latest stuff. i took the Wild Horses along. It took up the length of the settee and she was delighted with the colours. I then realised that the painting’s reflection in the shiny metal fire surround made the composition even more abstract. Aunty Ann’s shiny metal fire surround reflecting Wild Horses. Mick Burton, continuous line artist, 2017. 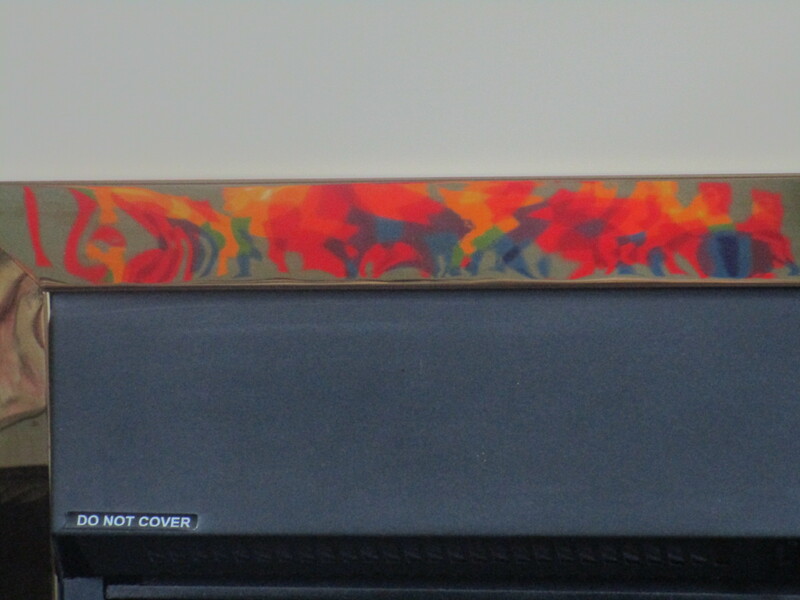 Two different Reflections of Wild Horses on metal fireplace surround, detail strips. Mick Burton, continuous line artist. This entry was posted in Abstract, Animals, Famous Artists, My Styles of Drawing and Colouring and tagged Abstract reflections, Alternate Overdraw, Alternate shading, black and white, breaking rules, Chapel Allerton, cheltenham Festival, colour range, colour sequence, coloured horse, Continuous line drawing, Horse, horses running, Kaleidoscopic, Lady Butler, Leeds Art Gallery, Mick Burton, Mick Burton continuous line, Mick Burton continuous line blog, Mick Burton demonstration, mick burton leeds artist, Mick Burton Yorkshire artist, mirror nature, natural result, Scotland Forever, Stainbeck Arts Club, wild horses on August 10, 2017 by mickburton2. 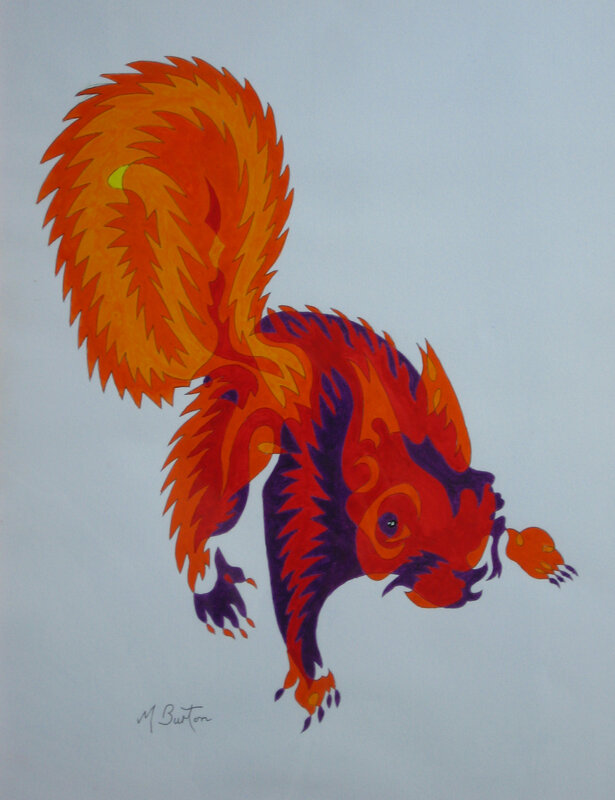 Red Squirrel, single continuous line drawing with colour sequence. Mick Burton, Leeds continuous line artist. This continuous line Red Squirrel, completed with colour sequence, is one of my pictures to be hung at the Leeds Art Exhibition and Sale put on for the 15th year by St Gemma’s Hospice. This colour sequence squirrel is the last of a series which began with my attempt to produce a continuous line drawing with a shimmering fur effect for the squirrel. 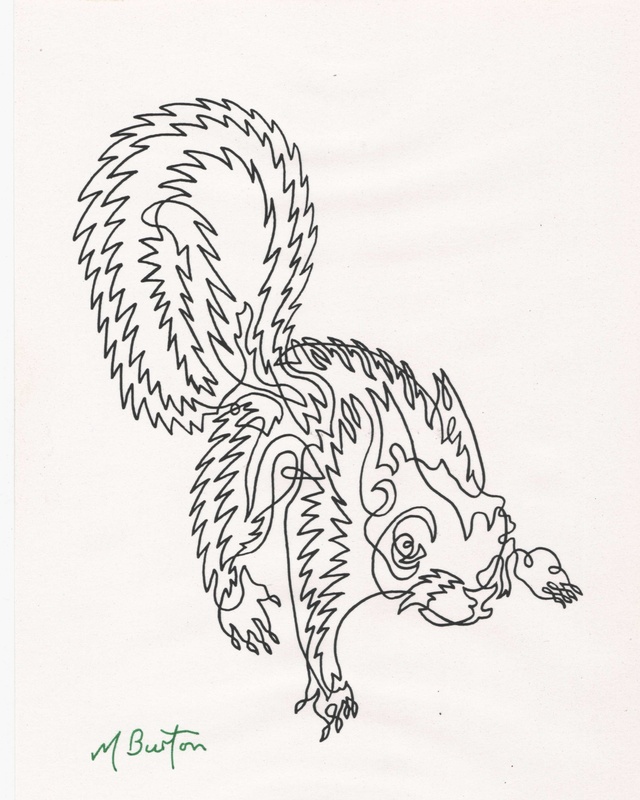 Single continuous line drawing of squirrel from 1970, with shimmering effect of fur. Mick Burton, Leeds continuous line artist. I have a treasured memory of seeing a Red Squirrel, when I was four, sitting on a wall next to our cottage at Arncliffe Hall, in the North Riding, where my Dad was Head Gardener to Sir Hugh Bell just after the War. I thought that completing alternate shading with copper paint would best reflect this colour in this picture from 1970. My daughter Kate said on the phone today that she remembered this picture being in the hall when she was young. 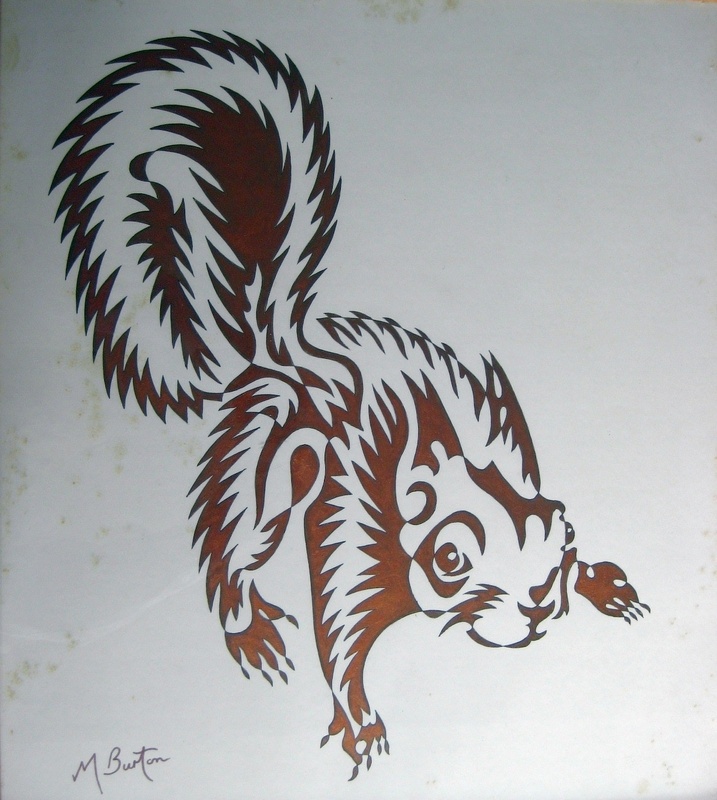 Red Squirrel, single continuous line drawing with copper alternate shading from 1970. Mick Burton, Leeds continuous line artist. I have many clear memories of living at Ingleby Arncliffe from the age of nearly two, to four and a half when we left. Falling out of my pram outside the local shop and crawling up the step was the earliest. There was a three legged cat, then at Sunday School one of the stamps I collected was “The Light of the World” by William Holman Hunt (my first taste of the Pre-Raphaelites) and I won the child’s sprint on sports day on the cricket ground. In the famous terrible winter of 1947, I remember Dad helping to dig a trench in the snow drifts down to the village. It was amazing to walk along the trench and not be able to see out. 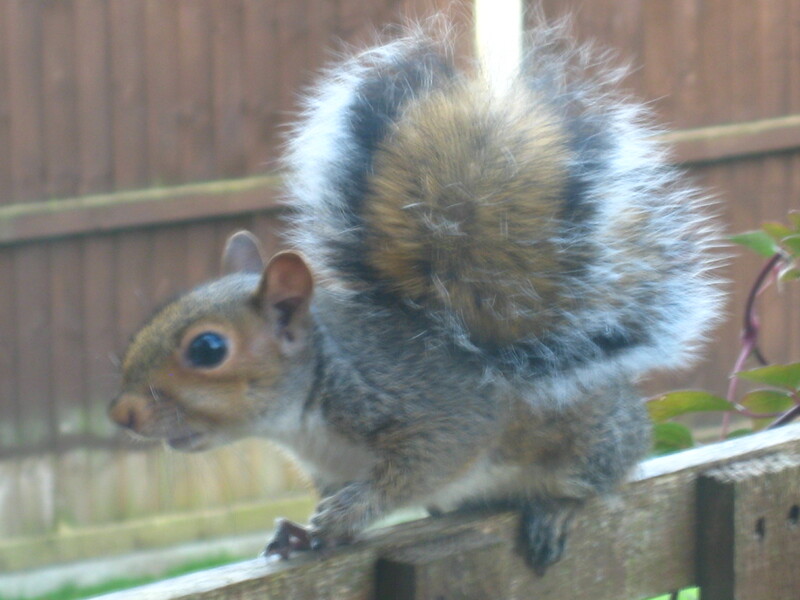 I only see grey squirrels now, mainly helping themselves to the bird seed Joan puts out. With Gledhow Valley Woods at the end of the garden we can have five of them at a time. Yesterday, a young squirrel was chased by a cat and ended up on the trellis a few feet from our dining room window. Joan chased the cat away and called to me as the squirrel was too scared to move. I took some quick photographs whist it was still there, but it became apparent that it was not going to move and was looking at me pleadingly. So I went out and shepherded it into the bushes. Here are some photos of a shimmering fur tail. Young Grey Squirrel from Gledhow Valley Woods. Three feet from my window after being chased by a cat. Mick Burton, Leeds artist. 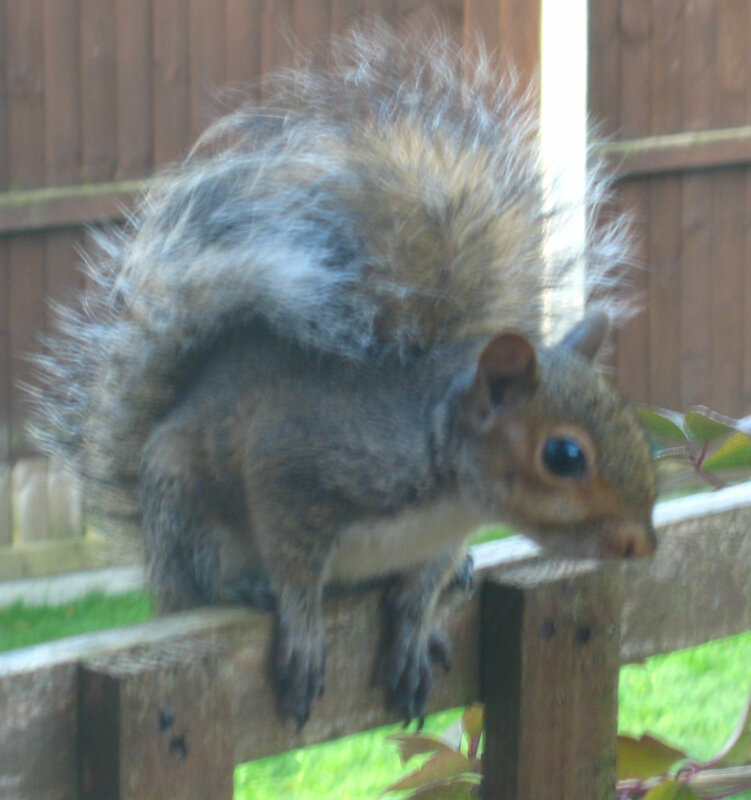 Young Grey Squirrel not daring to move, even though Joan had chased the cat away. Mick Burton, Leeds artist. 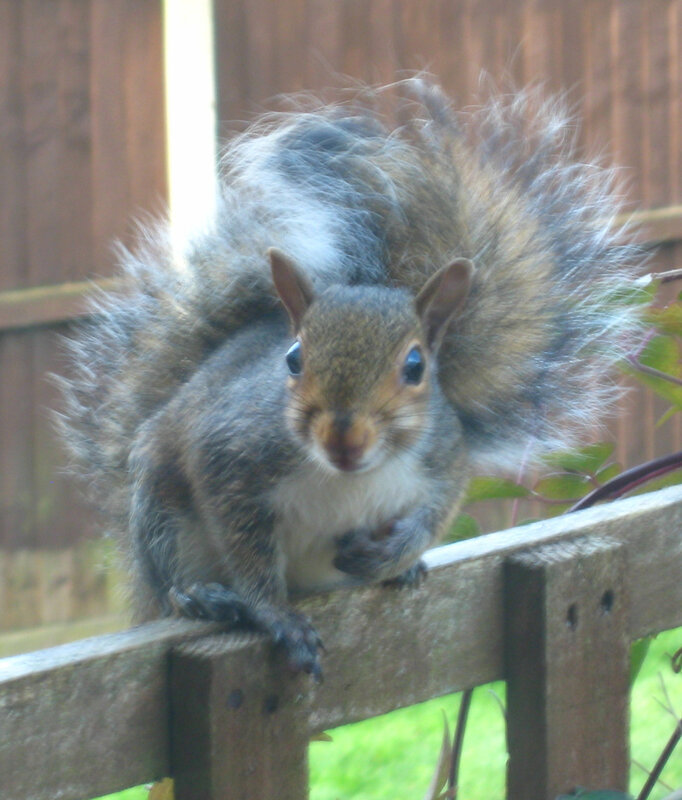 Young Grey Squirrel, imploring me to stop taking photos and do something about the cat. So I went out and shepherded it to the bushes. Mick Burton, Leeds artist. This entry was posted in Animals, Exhibitions, Famous Artists, Gledhow Valley Woods, Photographs, Young Policeman and tagged Alternate colours, Alternate shading, animals, Arncliffe Hall, Cat, colour sequence, Continuous Line, continuous line blog, Continuous line drawing, Gledhow Valley Woods, Grey squirrel, Ingleby Arncliffe, Leeds art exhibition, Mick Burton continuous line, Mick Burton continuous line blog, mick burton leeds artist, Mick Burton Yorkshire artist, photograph, police constable, post mortem, Pre-Raphaelites, Red squirrel, shimmering fur, Sir Hugh Bell, St Gemma's, The Light of the World, three legged cat, William Holman Hunt on October 21, 2015 by mickburton2. Leeds Carnival 2015 with photos by Mick Burton, continuous line artist. Red Indian head dress costume, Leeds Carnival 2015. Photo by Mick Burton continuous line artist. 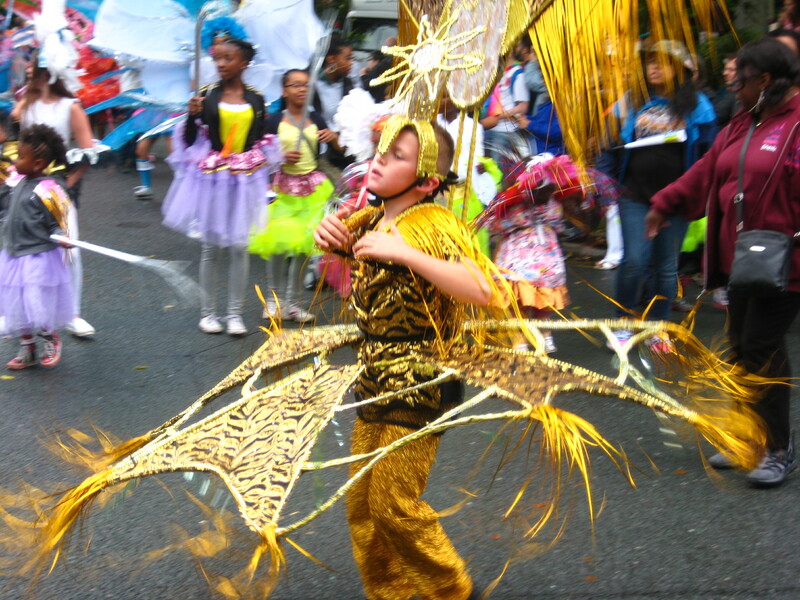 This was the first costume in the parade, preceded by one of several mobile steel drum bands. We stood on the first bend, near Gledhow Valley, after the parade’s initial stretch from Potternewton Park. 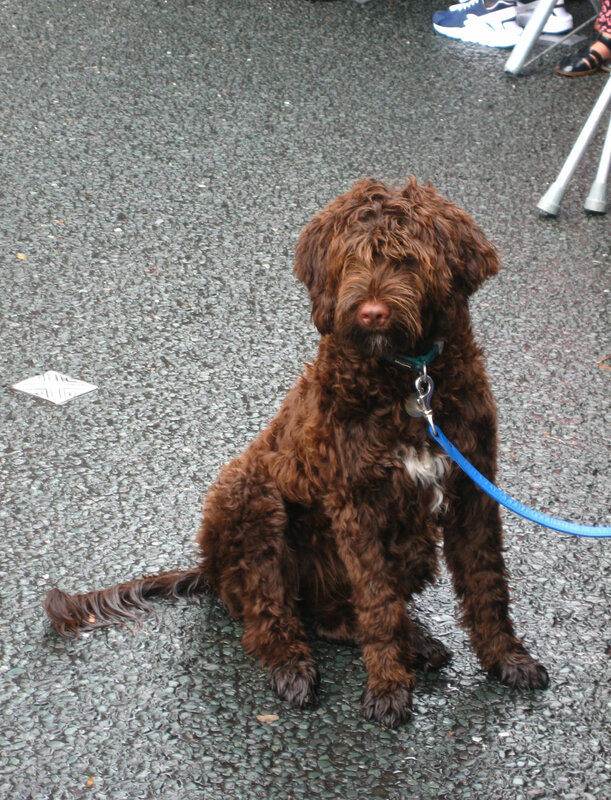 Cockapoo with wet paws waits for the Leeds Carnival parade to approach. Photo by Mick Burton, continuous line artist. It was a dull afternoon and drizzling. The Cockapoo loved the fuss from the crowd and waited for some action. 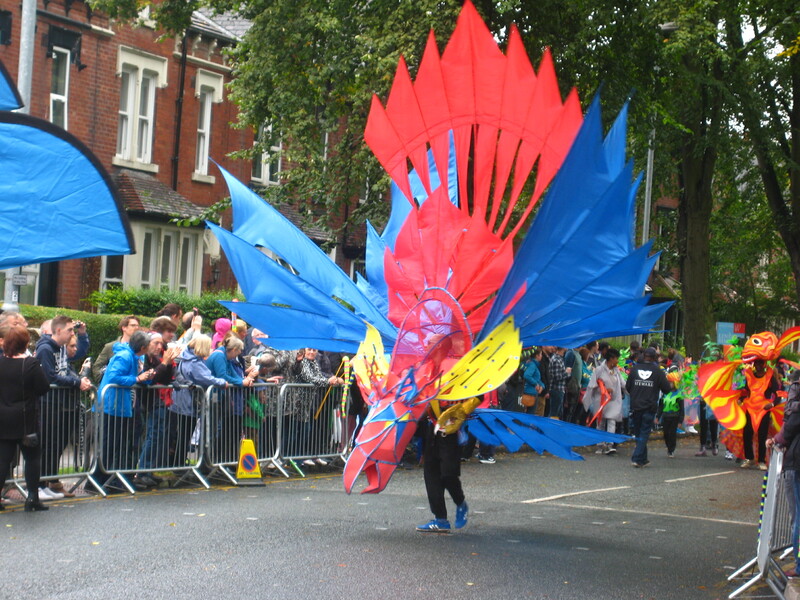 Red and blue costume in the Leeds Carnival matched the drizzle. Photo by Mick Burton, continuous line artist. Yellow and orange costume which lit up the parade at the Leeds Carnival. Photo by Mick Burton, continuous line artist. The drizzle had stopped and this costume, really lit up the parade. 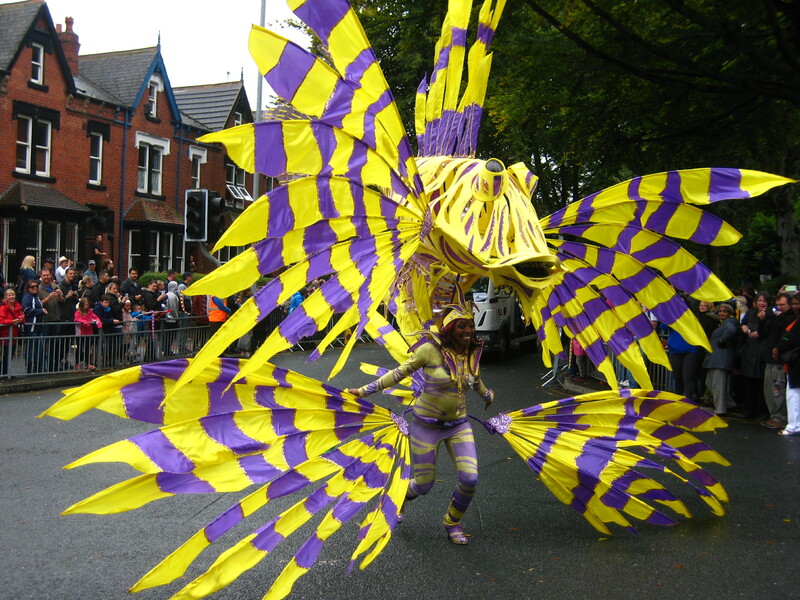 Violet and yellow costume at the Leeds Carnival. Photo by Mick Burton, continuous line artist. 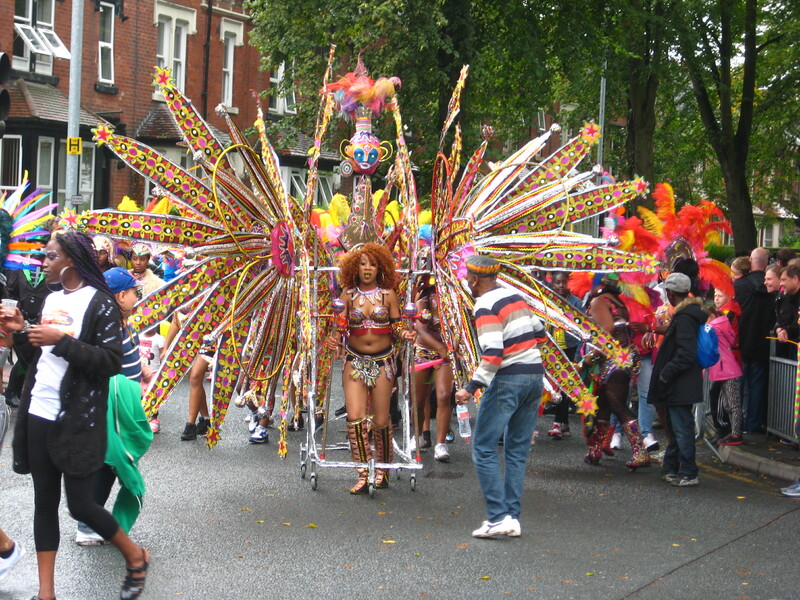 Razzle and Dazzle at the Leeds Carnival. Photo by Mick Burton, continuous line artist. 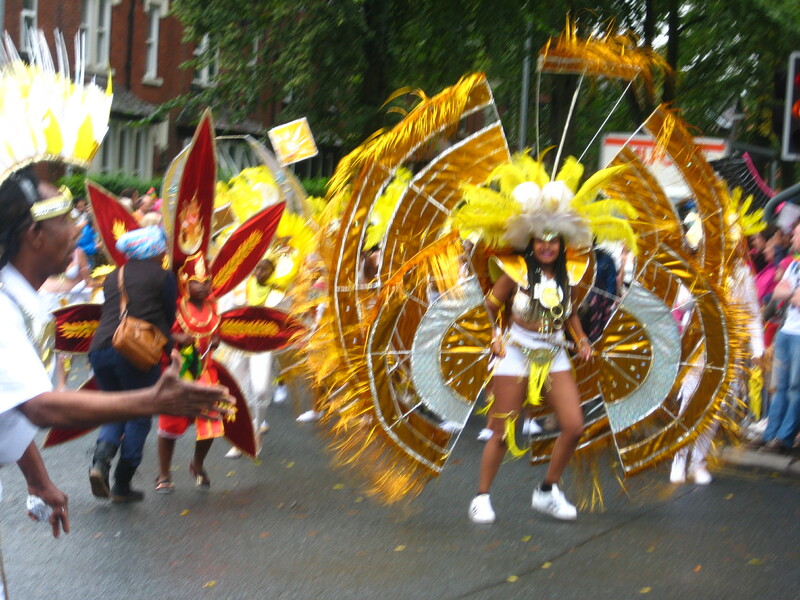 Gold costume at the Leeds Carnival. Photo by Mick Burton, continuous line artist. 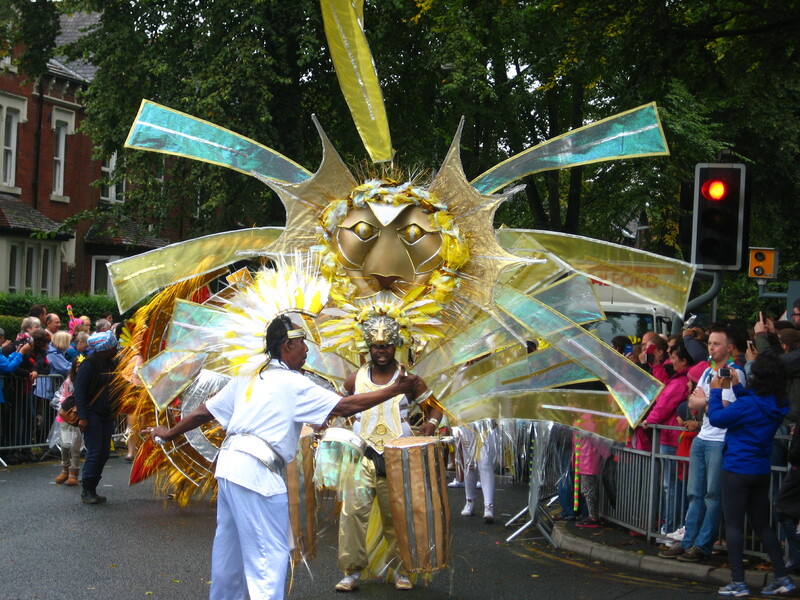 Lion King at the Leeds Carnival. Photo by Mick Burton, continuous line artist. 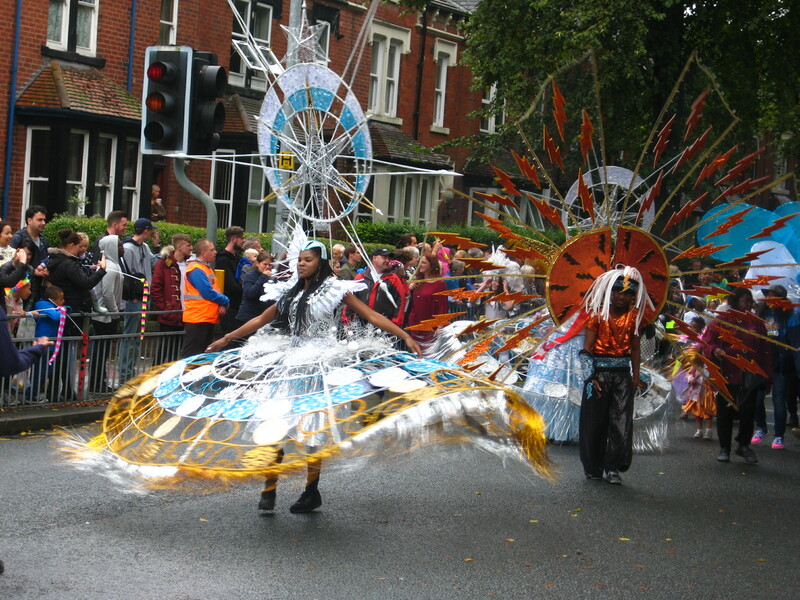 Catherine wheel costume at Leeds Carnival. Photo Mick Burton, continuous line artist. 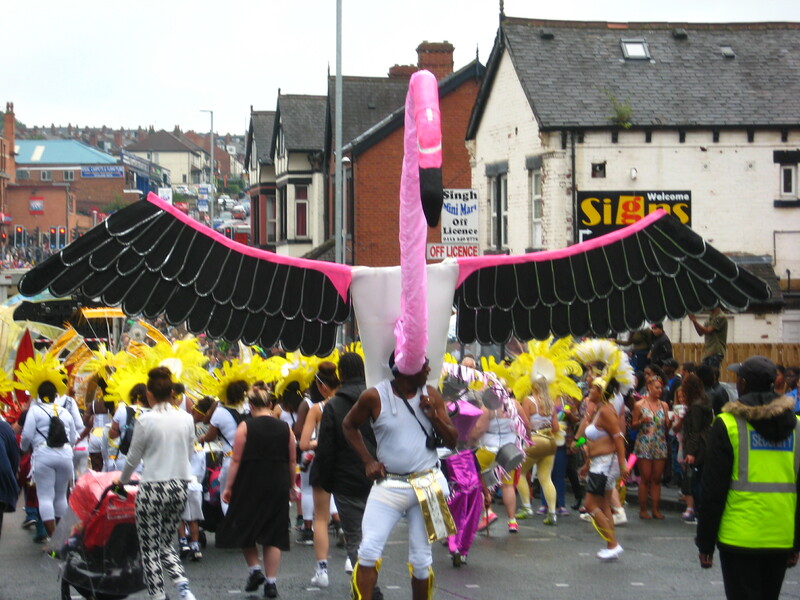 Flamingo costume at Leeds Carnival. Photo by Mick Burton, continuous line artist. 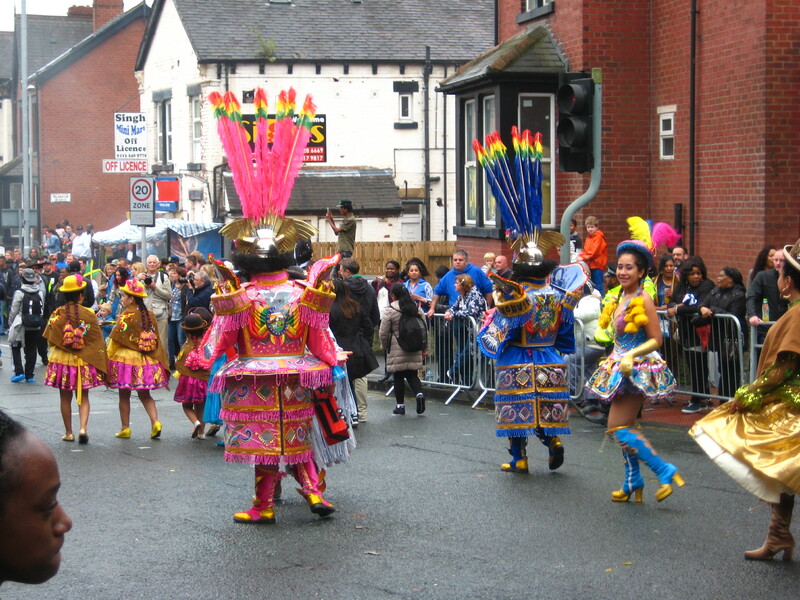 Bolivian costumes, back view, at the Leeds Carnival. Photo Mick Burton, continuous line artist. 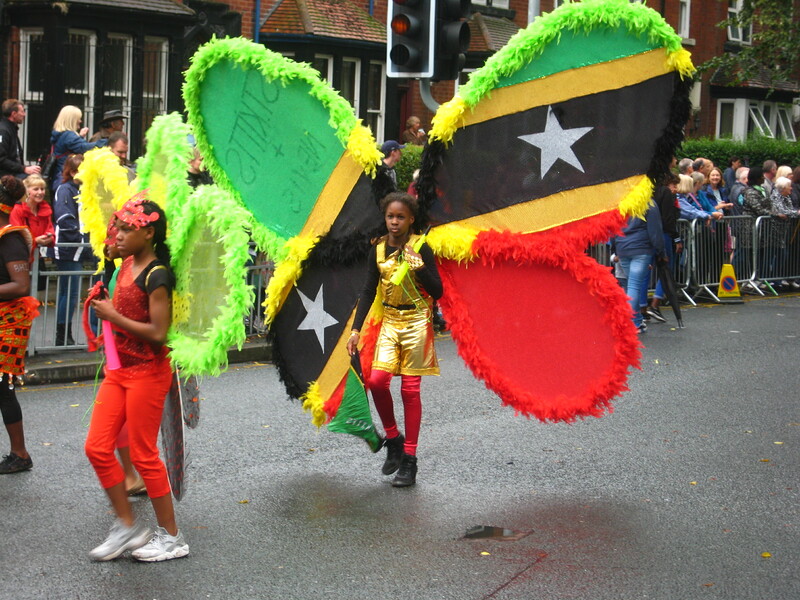 Jamaican costume at Leeds Carnival. Photo Mick Burton, continuous line artist. 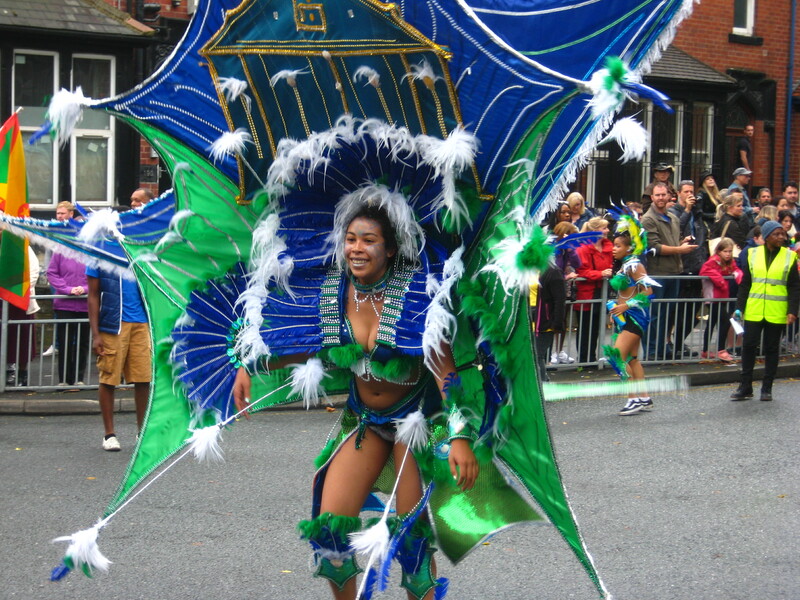 Blue and Green costume at Leeds Carnival. Photo Mick Burton, continuous line artist. 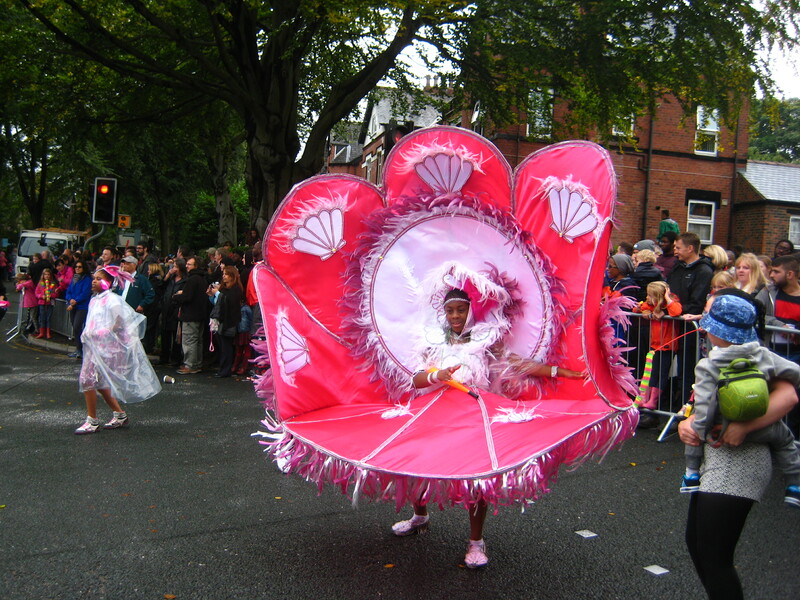 Pink costume at Leeds Carnival. Photo Mick Burton, continuous line artist. 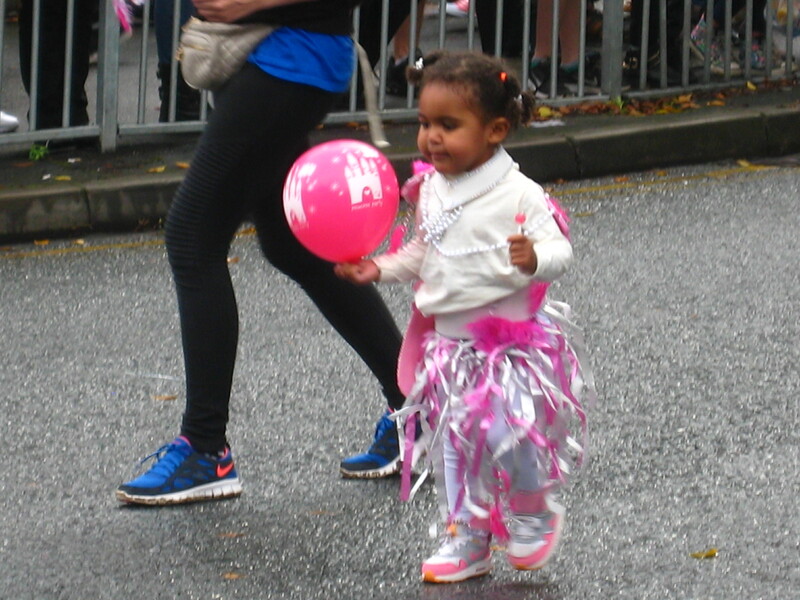 Child with balloon in Leeds Carnival parade. Photo Mick Burton, continuous line artist. 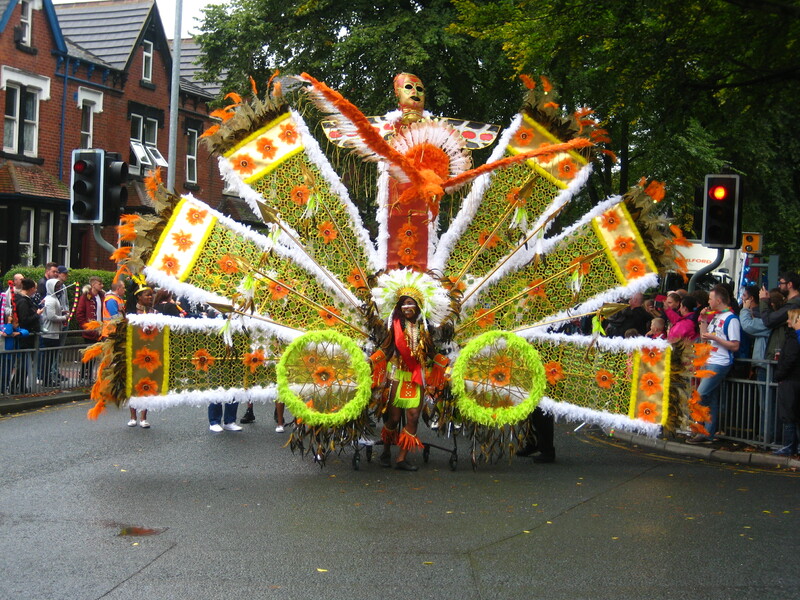 Multi petal costume at Leeds Carnival parade. Photo Mick Burton, continuous line artist. So there we are. Another very entertaining Leeds Carnival parade. The colours lit up a dull afternoon until the sun came out. This entry was posted in Animals, Gledhow Valley Woods, People Portraits, Photographs and tagged animals, Bolivian, carnival parade, child with baloon, cockapoo, Continuous Line, continuous line blog, costume, flamingo, Gledhow Valley Woods, Jamaican, Leeds Carnival, lion king, Mick Burton continuous line, Mick Burton continuous line blog, multi petal, Potternewton Park, razzle and dazzle, red indian, steel band, steel drum band on September 12, 2015 by mickburton2. Stainbeck Arts Club Exhibition at Chapel Allerton Arts Festival, Leeds. on Saturday 5 September 2015. 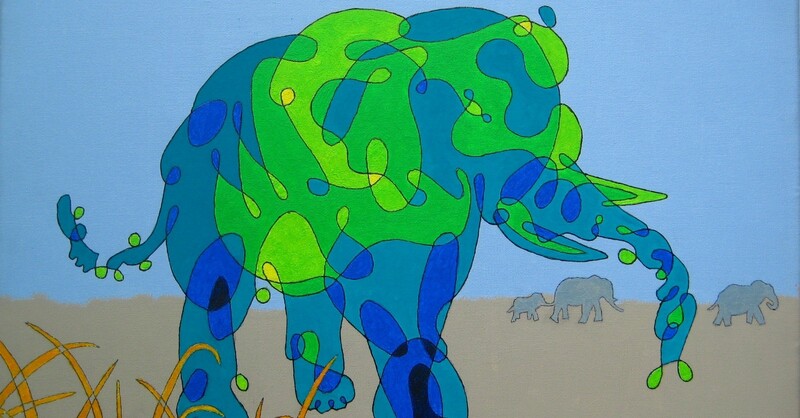 Paintings by Mick Burton, continuous line artist, are included. 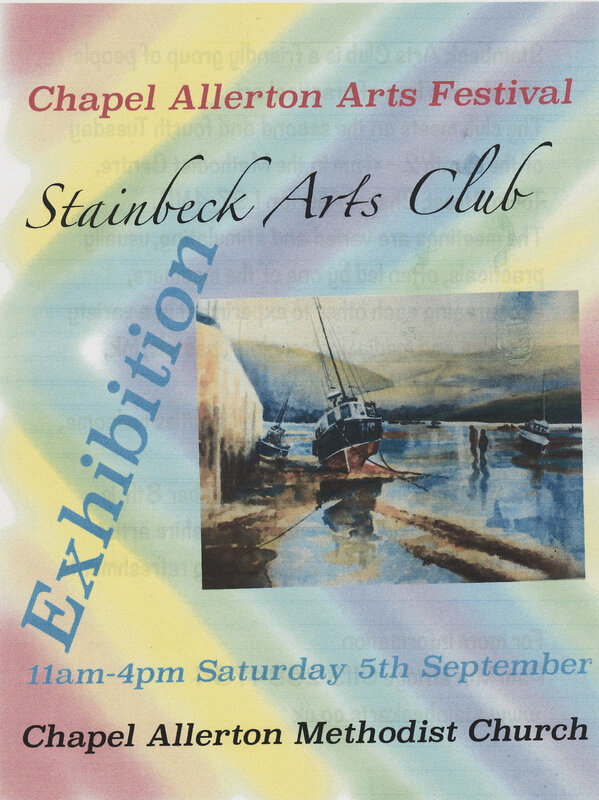 Stainbeck Arts Club, my local art club which is based in Chapel Allerton in north Leeds next to Gledhow Valley, is holding its Annual Art Exhibition as part of the Chapel Allerton Arts Festival. The Exhibition held in Chapel Allerton Methodist Church, which is situated at the lower end of the main Festival area, will be open from 10.00 to 16.00 on Saturday 5 September 2015. 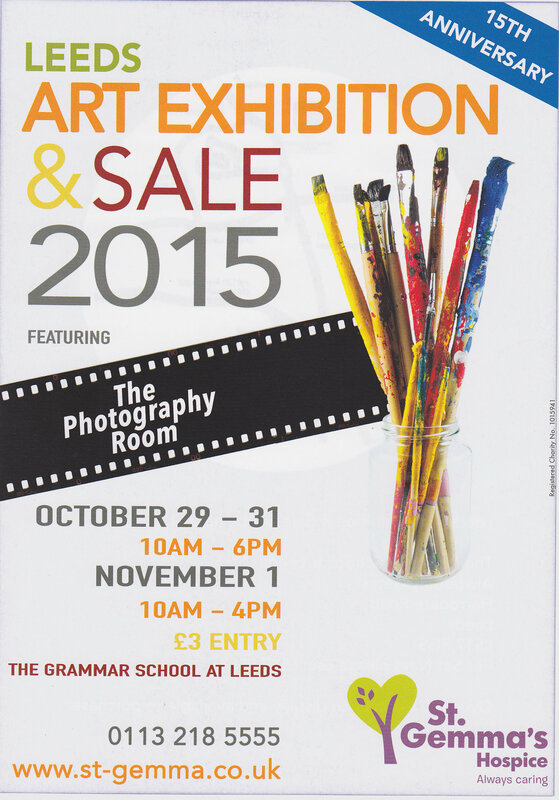 There will be many quality pictures on display, so if you are attending the Arts Festival do pop in and have a look. Admission is free. 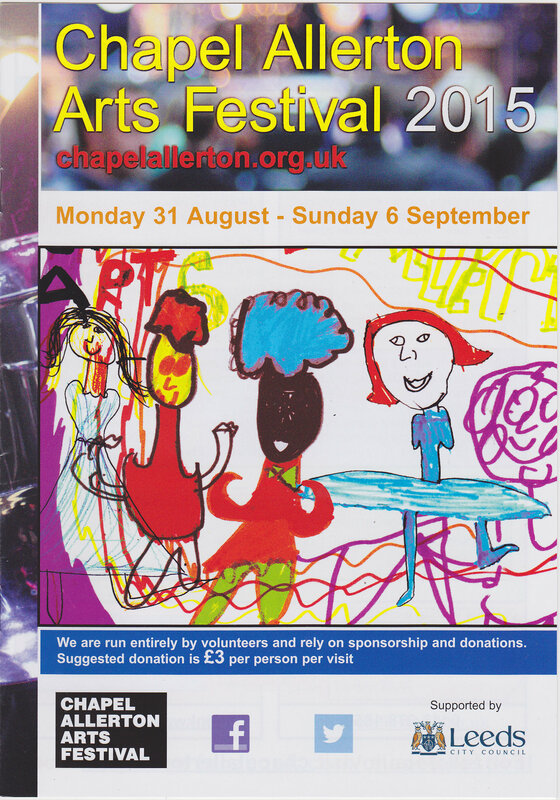 Chapel Allerton Arts Festival 2015, front cover of brochure. 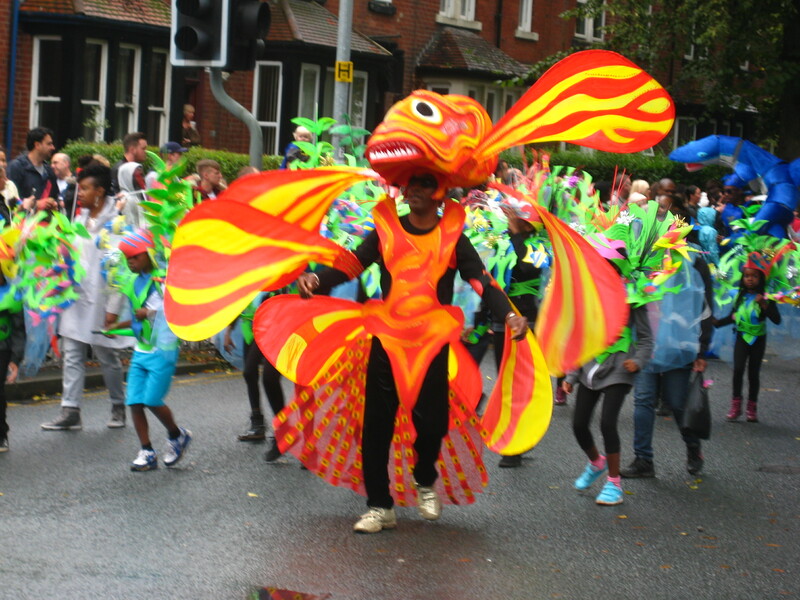 The Chapel Allerton Arts Festival was started in 1998 by members of the local community in a small way, with a few stalls and two bands playing from the back of a lorry in the evening. It now runs from Monday to Sunday and involves many parts of the community at lots of venues during the week, including a Short Film Festival and an Art Trail. At the weekend two streets are closed off and the central parking areas taken over for all the stalls and events, including a main stage for the many quality bands. The festival is still run entirely by volunteers. This year the Festival starts on Monday 31 August and the main day will be Saturday 5 September when people will arrive from all over the place to attend one of the star attractions in the Leeds calendar. This entry was posted in Exhibitions, Gledhow Valley Woods and tagged Chapel Allertn, Chapel Allerton Arts Festival, Continuous Line, continuous line blog, Gledhow Valley Woods, Mick Burton, Mick Burton continuous line, mick burton leeds artist, Mick Burton Yorkshire artist, Stainbeck Arts Club on August 29, 2015 by mickburton2.